The beautiful Tamar River is the perfect backdrop for your special day. Experience the Tamar Valley in a new light; the modern riverfront precinct, rolling hills, heritage buildings and the magnificent Cataract Gorge. 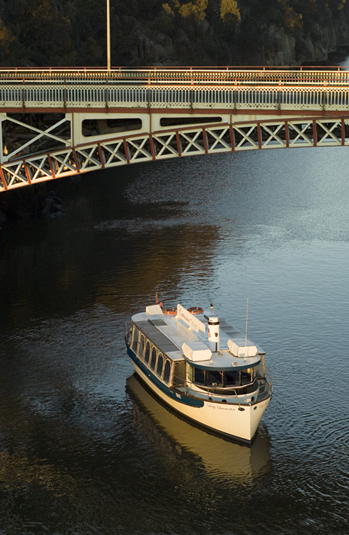 Launceston's Tamar River is sheltered and celebrating your function on the water is truly memorable. Tamar River Cruises has been operating since 1996 and has won multiple awards, we have carried hundreds of thousands of customers and have earned a highly respected reputation. We understand that planning a wedding can be complicated so we make it very easy for you. Your cruise can be designed to suit your budget and your schedule. Many couples have both the ceremony and the reception on board, as the Cataract Gorge is the perfect backdrop for saying "I do". Celebrating your wedding with Tamar River Cruises is a great way to create lasting memories.